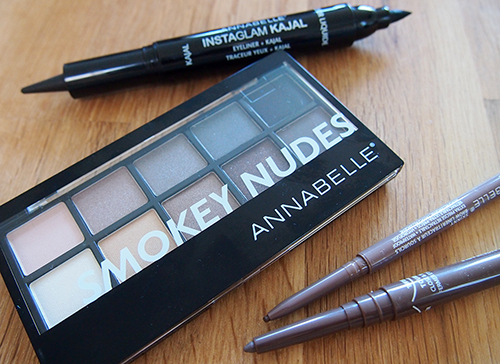 Annabelle Cosmetics had a bunch of new releases last Fall (I know, I'm super late on this... bad beauty blogger...) including the Smokey Nudes Eyeshadow Palette, a new drugstore entry in the neutral palette game. There can never be enough of these, can there? Smokey Nudes features 10 shadows in a range of warm and cool tones from light to dark, clearly aimed for maximum versatility. The texture is on the dry and powdery side, but this makes it easy to blend. I found the pigmentation to be decent though the shadows are not opaque enough if you're looking for a very dramatic effect. However, retailing for only $12.95 CAD, this is a great offering if you want a starter palette of neutral shades without the pricing of an Urban Decay Naked Palette. In addition to Smokey Nudes, Annabelle released some other eye products that I was pretty excited to try out. The Instaglam Kajal is a 2-in-1 with a thick felt tip liner on one end and a twist-up kajal for the waterline on the other end. And then there were the brow products! The Stay Sharp Long Wearing Brow Liner is a waterproof brow pencil with a twist (literally). The innovative cap sharpens the retractable pencil every time the cap is twisted back on and somehow keeps the shavings in there too. For a cheaper alternative to the Anastasia Brow Wiz (my current HG eyebrow pencil), the Skinny Brow Liner is quite impressive. The actual product is almost identical to the Brow Wiz, although the brow shaping comb at the end is kind of useless (the Brow Wiz has a spooly which is much more effective). I used all of these products for the above FOTD and was able to achieve a very wearable neutral eye look (basically what I wear on the daily). Overall, I'd say these are some good drugstore alternatives to more pricier options, and from a lovely Canadian company to boot! I love those shades, you can never have too many neutrals! Your makeup looks so gorgeous! I saw this palette at the drugstore the other day and debated. The shades look so pretty. Love the makeup look. 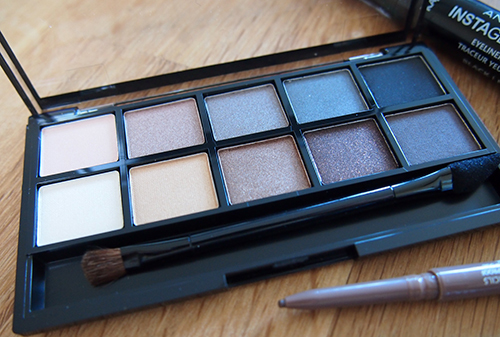 The palette definitely contains the perfect neutrals for a beginner. I do not need anymore neutral palettes though haha. Love it so much, you look gorgeous. wow! really nice.. :D by the way would you please visit my blog too at http://www.caimanhaitifoundation.org/ thanks! Nice look! 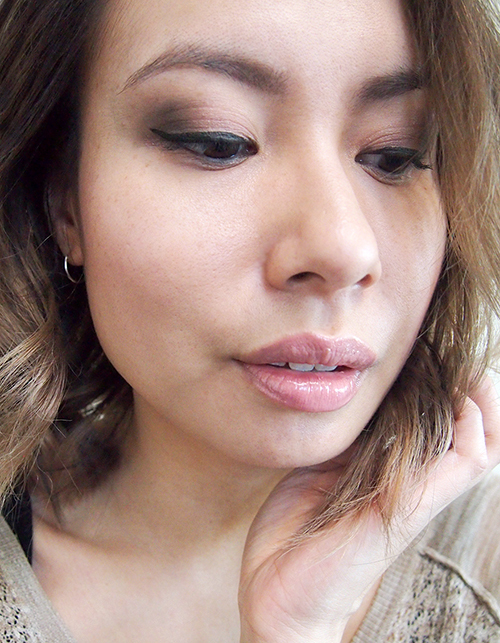 I love Annabelle for affordable makeup!